So I’m at the park and I’m really flippin’ hot, and the water from my trusty water bottle isn’t doing enough to rehydrate me. What’s a mouse to do? 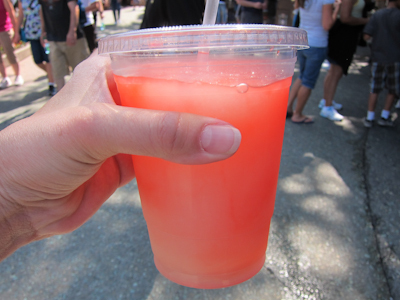 I decided that what I’d really love is a hand-squeezed lemonade. You know the kind–where they have the press in front of you and just stick in half a lemon, press it down, and add it to some sugar water and ice? I love those. LOVE! Unfortunately, Disneyland doesn’t sell that. Incidentally, I seriously want to get one of those squeezers for home use. We have the Lemon Tree That Ate Manhattan in our backyard and the number of lemons it produces for us is a little on the insane side. I love lemonade, but I hate doing all the squeezing in our little hand twisty juicer thing. But anyway. 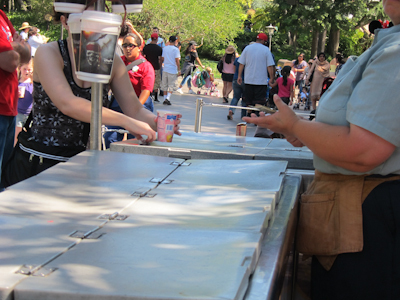 So I’ve got a hankerin’ for lemonade at Disneyland, and I pass a bunch of ice cream carts offering Frozen Lemonade. 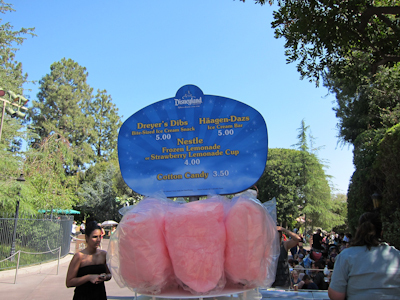 And then I pass this fruit-and-chip stand type thingie over by Casey Jr. (and the site of the dearly departed Fantasyland Skyway station *sniff*) and I see that they are offering “Frozen” Lemonade. Just like that. With the quotes. As a writer, I get rather twitchy when it comes to misused punctuation. Well, when it comes to misused apostophes, I get absolutely apoplectic. But quotes bug me too, and I’m thinking come on Disney, surely you’ve got an editor on staff there somewhere. Quotes are, of course, used to note when someone is speaking (eg. So then Mickey Mouse said, “Shelby, why does misused punctuation bother you so much?” and I said, “Because it’s the ruination and downfall of our civil society, and also it’s not that hard.”), and quotes are also used to denote something similar to, but not really, but kinda close or at least trying to be (eg. Turkey “bacon”). 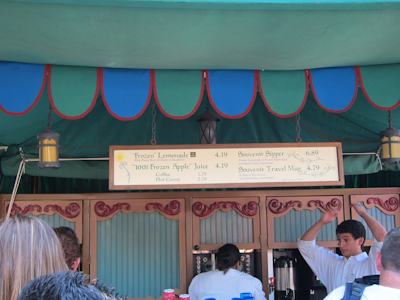 So assuming that Disneyland has an editor somewhere on the payroll, what exactly is it that makes “Frozen” Lemonade kind of frozen, but not quite frozen? I mean, it’s either frozen or it’s not, right? And then what’s the deal with non-quoted Frozen Lemonade available from the ice cream carts? How many variations on Frozen can we possibly have? And what is so special about “Frozen” Lemonade that makes it worth 19 cents more than Frozen Lemonade? Who comes to Disneyland to buy Cheetos? Look, just buy yourself some popcorn and a churro and enjoy it. I noticed a slushee-type machine in the background. I’m so observant sometimes. Rarely. And using my clever powers of deduction, I thought that “Frozen” Lemonade would be like a slushee lemonade, and Frozen Lemonade would be like that solid block of lemon-flavored ice you get in a cup that you have to chip away at with a plastic spoon when nothing short of an ice pick will do the job. I hate those, by the way, because I just don’t want to work that hard for my food. Mine had a shot of raspberry, and it was actually really, really good. I may have to make this my beverage of choice to go with my salty popcorn if water isn’t doing it for me. 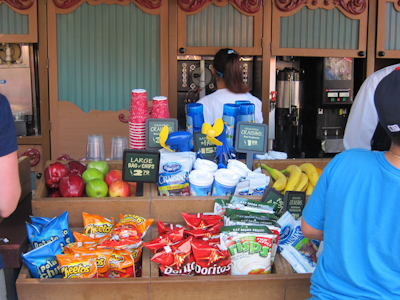 But also, if you read the sign closely, the “Frozen” Lemonade stand also sells “100% Frozen Apple” Juice and that, my dear Disney, is just incorrect. The treat you are serving there is not 100% frozen, nor is it likely made from 100% frozen apples. And if it’s “Apple,” then it’s not really apple, so what the hell is it? I think you’re going for “Frozen” 100% Apple Juice to accompany the “Frozen” Lemonade, but then that makes me wonder, the Lemonade didn’t specify that it was 100% Lemonade. Maybe it was some percentage of lemonade and some percentage of something else? Disney, you need an editor. Your comments about the quotation marks sound EXACTLY like what I would say if I was there. Why can’t they just call it Lemonade Slush? Or Blended Frozen Lemonade? One of these days I will do as my husband regularly suggests and put together a correction kit, so I can add or subtract punctuation on signs as needed. I love Cake Wrecks, although I often need an adult diaper reading it. Sometimes I feel like I should become a graffiti artist correcting all improperly used punctuation. A punctuation Robin Hood, as it were. Your “Frozen” Lemonade looks so good! It really creeps me out when people use quotation marks with food. I feel the same way when a food item is purposely misspelled like Chick’n. Oh, no joke on the Chick’n. I mean, I like donuts and call, but Krispy Kreme is big hurdle for me to cross too. Then there’s Playskool, a brand that makes items specifically for children that misspells the word “school”….which has nothing whatsoever to do with lemonade, frozen or otherwise, or chicken with or without an apostrophe, or even food at all. I can have, and have had, extensive conversations on this topic with my sisters, one of whom is a former grade school teacher. Now that “frozen” lemonade really looks delicious, and I might have to wrangle one up once our blackout period is over. The “frozen” lemonade looks a lot more appealing than the frozen lemonade. My guess is that neither treat has much lemon/”lemon” in the recipe. Rant anytime. I hear you. I can “work” at home without signing up with some shady company…in fact, that’s what I’m doing right now! I am cackling over this post and the comments. I feel the same way about grammar and spelling. It’s something you learn early on in life and it is repeated EVERY SINGLE YEAR in elementary school. I work at a hospital and we have a binder with a roster of all the doctors who work at our facility. Well, my co-worker wrote on the outside of the binder “doctor’s”. I feel like a jerk if I try to correct her but the binder does not belong to the doctor, it is a binder with a list OF doctors. And this has nothing to whatsoever with food or Disney. Oh well. I’m so glad I’m not the only one who gets bent out of shape by bad grammar out in public. Will someone please start a blog where we can post evidence of these faux pas? We can start a revolution! Seriously. A little piece of me dies every time I see an errant apostrophe. Oh man “frozen” apple juice (c’mon Disney, is slush/slushie a dirty word?)!!! Sonic used to do those, but they quit, and I’ve missed it. It’s not the same as making it yourself in the freezer, the consistency gets all wrong and the water separates. Good to know there’s still somewhere I could get a fix, even if it would cost me a (mouse) arm and a leg.